Animal research and the University of Edinburgh: What does openness look like? Speaking of Research have long urged research institutions to improve the information they provide online about their animal research. It helps the public understand how and why such research goes on, as well as reduces the number of questions an institution needs to answer by making such information readily available. The animal research information websites of Speaking of Research and Understanding Animal Research also received full marks. See the grading system here. 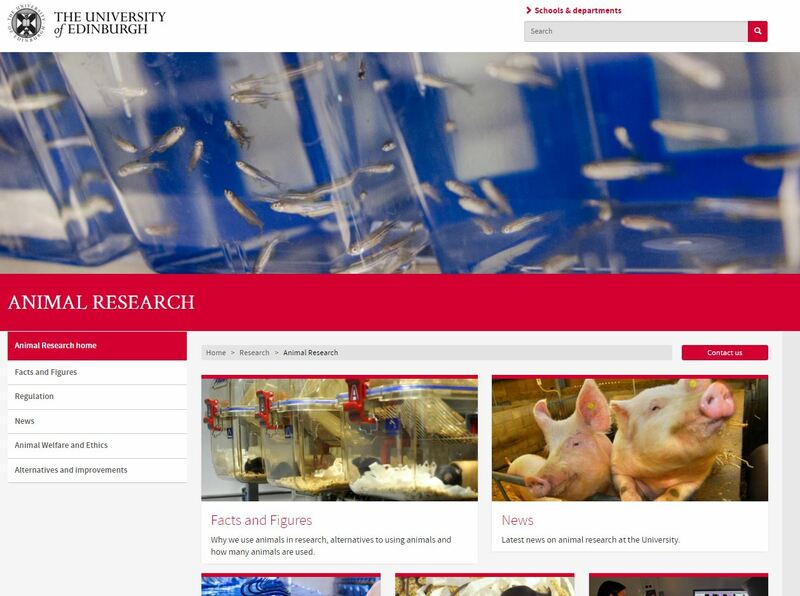 Recently the University of Edinburgh (UK) was awarded full marks for its new animal research section of its website. Edinburgh is one of the top ranked universities in the world (24th in THES), with a strong history in biomedical science. Unsurprisingly it is also one of the highest university users of animals in the UK (1st in 2013, 2nd in 2014). The recent update of their animal research pages have fulfilled our criteria for “More information”, “Extensive Information”, “Case Studies” and “Images/Videos”. Let’s have a closer look at how it achieved this. The first thing to say is the ease with which the website can be found. It is the second option on Google if you search for “Edinburgh University Animal Research”. It is the second option if you search for “animal research” through the University of Edinburgh website (in both cases the first link is the Roslin Institute – which is part of the University and focuses on animal health research). The website can also be found by clicking “Research” at the top of the page, then finding the “Animal Research” link on the following page. The website begins with a strong statement in its Facts and Figures section. Many of the medical breakthroughs we take for granted today – including vaccines, antibiotics, painkillers, asthma inhalers and cancer drugs – would not have been possible without research involving animals. Animal research remains essential for developing new medicines and veterinary medicines, and for advancing our understanding of the body in health and disease. We are involved in a wide variety of medical and veterinary research investigating conditions that impact human and animal health across the world. These include diseases such as multiple sclerosis, Alzheimer’s disease, cancer and heart disease, as well as investigations in avian influenza and E. coli in farm animals. There are a number of pages explaining how and when animal research is conducted, including details on the regulation, welfare and the ethical review process. There is also a whole section on the 3Rs, including examples of how the University has implemented each of them. Finally, as an institution which is often FOI’ed for its animal numbers, it has taken the decision to publish these numbers openly. Such open information reinforces the view that the University of Edinburgh have nothing to hide. They signed the Concordat on Openness on animal research in the UK, which has helped drive many institutions into improving their web information – indeed one of the commitments signatories must abide by is to include a statement on their use of animals. Providing statistics online can also help take the momentum out of activist-driven stories about the number of animals used in research in a given institution – it’s generally not newsworthy when the information is freely available online. So all that’s left to say is well done to the University of Edinburgh for its fantastic web resources. Speaking of Research will continue to celebrate good examples of openness and public outreach wherever we can find it. Posted on March 16, 2016 by EditorPosted in News, Outreach NewsTagged animal research, University of Edinburgh, web statements.